Though Columbus Blue Jackets center Ryan Johansen feels like the weight he carried on his shoulders for two seasons has been lifted, all it means is that expectations for the 21-year-old are on the rise and the pressure is mounting. "I can see a level I want to get to," Johansen told NHL.com. "In Pittsburgh [on Dec. 9], my line was matched up against Sidney Crosby's line the whole game, and he was pretty tough to keep up to. At times I felt I was right there with him, and then there were times when I was chasing him all over the ice. It's exciting, though, feeling that I'm getting close and can be a good player in this League." Johansen has proven at least that much this season with a team-high 27 points in 34 games, including 11 during his current nine-game point streak. He had 33 points in 107 games over his first two seasons. Blue Jackets center Brandon Dubinsky said Johansen's preparation has improved this season. "He's not having these highs and lows, which you often see with young guys, especially young, talented guys," Dubinsky told NHL.com. "He's starting to come into every game and believes he can dominate those games. He's a big-bodied player who has the skill level of a little guy. He's definitely starting to take over games more and more." It starts with general manager Ray Shero, who sets the tone. Their amateur scouting staff has done great work picking out guys like Olli Maatta and Jayson Megna. Their pro scouts knew Jussi Jokinen would fit into the lineup, so Shero traded for him last season. The trade has been great for Pittsburgh. Dan Bylsma is one of the top coaches, and like most good franchises there is uniformity from top to bottom. The Wilkes-Barre/Scranton Penguins of the American Hockey League club use the same systems and vocabulary that the Penguins use, so when players get called up they get slotted into familiar positions and play a system they are accustomed to playing. Of course, it helps that they have some of the world's best players and they're getting outstanding goaltending. OK I'll admit it, I had to go look this one up. I haven't heard much about Colton Orr of late. I'm not sure anyone has. However, since you asked I did some digging and asked around to find out an answer. What we know is that Orr is on injured reserve and missed his eighth straight game with an elbow injury. What we don't know, and this probably isn't the answer you're looking for, is that his return date is still TBD. He can develop into a standout player, maybe even a star, if the New York Islanders do right by Strome and put him in positions to succeed. He needs to play with good players at the NHL level, and he needs to be given some time and some freedom to find his game. He can't be afraid to make a mistake on the defensive end because that will affect his overall game. He's an offensive player who should be afforded the ability to use his creativity to develop scoring chances. If given that freedom, Strome should be good for the Islanders for years to come. I can't say that the request is off the table because Erat hasn't said that to anyone, but the Capitals might not be so eager to grant Erat his request right now. Erat was Washington's second-line center Tuesday. He wanted to play more minutes and because of injury and Mikhail Grabovski's illness (flu) he's getting the chance. His value to the Capitals might be higher now than his value is in the trade market. That said, the NHL holiday roster freeze goes into effect Thursday and lasts until Dec. 27. We'll see if anything happens. Absolutely. No question about it. Even before Stamkos got hurt, nobody expected the Lightning to be 12-5-0 out of the gate. Obviously Patrick Roy, Bruce Boudreau and Michel Therrien are on pace to deserve consideration as well, but for right now at least Cooper has to be considered in that mix. It should be noted, however, that the Lightning are a bit lucky that the Detroit Red Wings have been banged up, the Toronto Maple Leafs have slumped and the Ottawa Senators have not looked like the team they should be yet this season. If you have a question you want answered in Over the Boards, send it in a tweet to @drosennhl. The Mailbag will be a weekly feature here. Despite his age and obvious need to grow up in the NHL, Johansen spent his first two seasons wondering if he would ever come close to reaching the potential he came into the League with as the No. 4 pick in the 2010 NHL Draft. He never felt like he was good enough to control the pace of the game, let alone set the pace like elite players do. He never felt fast enough or strong enough to play opposite the best centers. Of course, nobody in Columbus expected him to be at that level as a 19- or 20-year-old, but try telling a high draft pick that he still has to grow into his 6-foot-3 body and go through the growing pains of a young player trying to make it in the NHL. "I knew I had something to prove," Johansen said. "People were kind of waiting to see me develop and become the player they thought I could be." Johansen felt confident about his good moments against Crosby in Columbus' 2-1 loss to the Pittsburgh Penguins. He recalled a game against the Boston Bruins in late November when he never felt out of place going up against Patrice Bergeron or David Krejci. He played well when matched up against Mikko Koivu and Zach Parise of the Minnesota Wild. "It really is when you think about it," Johansen said. "At the start of this year it kind of clicked for me. I felt faster. I felt stronger. I felt I could beat guys to pucks more often. Those little things help you become an elite player." But Johansen isn't there yet. Blue Jackets general manager Jarmo Kekalainen wants to make sure he remembers that. "I think he has the ability to set the pace for the shift every time he steps on the ice, but you have to be in top condition, strong, fast, all those things," Kekalainen told NHL.com. "He's still young. He has to do more work on his body to get stronger, faster, more endurance. The top players are the top players because they set the pace consistently, shift after shift. "He's just starting to realize the potential he has. The sky is the limit for this guy with the size and skill he has, but there is so much more room for improvement even with the season he's having." Chicago Blackhawks coach Joel Quenneville said injured goalie Corey Crawford is expected to get on the ice later this week. "Hopefully he's not too far away once he gets on the ice," Quenneville told NHL.com, adding that backup Nikolai Khabibulin is not skating so it's hard to draw up a timeline for his return. For now the Blackhawks will continue to operate with Antti Raanta as their No. 1 and Kent Simpson as his backup. Neither played in the NHL before this season, but Quenneville has shown no signs of concern because the veteran coach thinks the current situation in Chicago is a breeze compared to what he had to handle early in the 2002-03 season, when he was the coach of the St. Louis Blues. "Nobody will ever touch this scenario -- we won five straight games with [four] different goalies," Quenneville said. "That's chaos to a different level. I can't even remember the reasons. I don't know the reasons. But I know that happened." Quenneville is referring to a stretch of five games from Oct. 15-26 when the Blues used Reinhard Divis, Curtis Sanford, Cody Rudkowsky and Fred Brathwaite to beat the Carolina Hurricanes, Blue Jackets, Dallas Stars, Edmonton Oilers and Calgary Flames. The 30 minutes Rudkowsky played in a 2-1 win against Edmonton were the only minutes he played in the NHL during an eight-year pro career. The Blues used seven goalies that season, including Tom Barrasso, Chris Osgood and Brent Johnson. "That was crazy," Quenneville said. "It was absolutely unbelievable what happened that we had to play all these goalies in five straight games, and to win them all was even more unbelievable. That will never happen again, especially with winning them all." It might have been a case of too much too soon for Nashville Predators rookie defenseman Seth Jones, so coach Barry Trotz has pulled back on the 19-year-old's ice time in order to try to build his confidence back up. Trotz told NHL.com he thinks it's working because in limited minutes, at least compared to what he was playing, Jones "seems fresh again, he's vibrant and he's making good plays." The fact that Roman Josi returned to the lineup as a top-pair blueliner has allowed Trotz to take some ice time away from Jones. "I feel comfortable with 17-20 minutes a night," Trotz said of Jones' ice time. "Some nights it'll be more and some nights it'll be a little bit less, but it's about getting him back into sort of that area. His game will dictate that he gets those minutes too. He's playing good now. I don't see it being a problem." Jones was averaging 23:56 per game through 29 games and twice played more than 30 minutes. He then went from playing 24:40 against the Carolina Hurricanes on Dec. 5 to 12:42 against the Washington Capitals two nights later. He played a season-low 9:29 on Dec. 10 against the New York Rangers, 11:00 on Dec. 12 against the Dallas Stars and 13:56 on Dec. 14 against the San Jose Sharks before going back down to 11:56 Tuesday against the Blackhawks. He was taken off the power play, but Trotz said he will get some of those minutes back. "He did terrific, he really did, but a young man playing those minutes at this level, he sort of hit a little bit of a wall," Trotz said. "He hit that wall and didn't have the juice in his game at a certain point, so we did it by design and also by Roman's return." For as good as the Anaheim Ducks have been at Honda Center this season, and they are the only team in the NHL without a regulation loss at home (13-0-2), coach Bruce Boudreau admits some of the success can be chalked up to fortunate scheduling. "Team Canada has a lot of talent and a lot of different kind of players to be looking at. At the same time, Sharpie has had an outstanding year. This is his most solid year since I've been here. The consistency has been in place. He's been a threat offensively. That line has been very important for our success. The power play has been very important for our success and he's been outstanding in that area as well. He's been everything he can be. He got invited to the camp this summer and I would think he's going to get strong consideration. Hopefully he's on the team." "We think when kids come out of junior that they're going to play in the National Hockey League and they are, they're going to be contributing players, but look at the top kids in the draft. [Nathan] MacKinnon was on the third line. [Aleksander] Barkov is on the second line. [Jonathan] Drouin is playing in juniors and then Seth [Jones]. I think we have these high expectations for these players and they're going to be probably exactly what we expected they would be, but sometimes we forget that they're 19 years old and they're playing against the absolute best players in the world. That's a lot to ask from a 19-year-old player.'" Seven times the Ducks have faced a team on their home ice that played the night before. Anaheim is 6-0-1 in those games. Anaheim was the third stop on the NHL's California tour for the New York Rangers, Ottawa Senators, Buffalo Sabres, Vancouver Canucks and Tampa Bay Lightning. The Ducks went 5-0-0 in those games. "I don't think it hurts, quite frankly, that a lot of times [the opponent] is playing in L.A. the night before or in San Jose the night before," Boudreau told NHL.com. "They're playing against really big teams that can soften you up a bit." Boudreau also thinks the Ducks' road schedule has something to do with their home success. "When we play on the road it's eight games at a time, four games at a time, and we're on it now for four games," he said. "The road record after a while it takes its toll, but the games we've had at home have been spread out. We've had a day off or two days off before we play the next one. I think it's advantageous to us." Anaheim is not scheduled to play home games on back-to-back nights this season. Boudreau will return to coach a game at Verizon Center on Monday for the first time since he was fired by the Capitals on Nov. 28, 2011. He'll actually return to Verizon Center on Sunday because the Ducks are scheduled to practice in the Capitals' home building in advance of the game Monday. How long has Boudreau been thinking about his return to D.C.? "Oh, for about two years," he said. Boudreau coached the Capitals for four years, compiling a 201-88-40 record. He won the Jack Adams Award in 2008, four consecutive Southeast Division titles and the Presidents' Trophy in 2009-10. The Capitals, though, never made it out of the second round of the Stanley Cup Playoffs. "I'll be nervous, but it'll be fun seeing a lot of the people," Boudreau said. "I love the building, and I love playing there because it's always full and it's always loud. It'll be fun going back, but I'll be nervous. A lot of those players on that team were there when I was there and I knew them very well. We sort of grew up together in Hershey. It'll be nice to see them, but if we get the opportunity to beat them I think we'd like to." The Colorado Avalanche drafted Nathan MacKinnon with the No. 1 pick because they were confident he'd be an impact player right away. They were accurate. MacKinnon has 19 points in 33 games. He is averaging more than 16 minutes of ice time per game and leads all rookies with 96 shots on goal. He recently moved up to the top line to play right wing alongside Matt Duchene and Ryan O'Reilly. Joe Sakic, Colorado's executive vice president of hockey operations, told NHL.com the best thing he's seen from MacKinnon so far is his fearlessness. "He competes. He wants it," Sakic said. "He doesn't back down. He's not scared of anybody. He goes to the hard areas. Obviously you want to bring him along slowly, but he's forcing it. He's done just a tremendous job, and he's willing to learn and do what it takes to be a complete player." When asked if any of that surprises Sakic, he quickly said no. "Well you were expecting a yes, but I wouldn't say it is surprising," Sakic said. "That's what we were expecting. We knew he was a competitive guy. It doesn't always happen with everybody when they do make the jump, but we expected it to happen [with MacKinnon]. "You can see he's much more comfortable now, but that comes from actually being out there and playing," he continued. "You just have to get used to the pace. For a guy like him it's realizing these guys are fast, but I'm still faster than them. He takes off. He flies." * The Blackhawks' penalty kill has been the team's lone Achilles heel this season, a problem that has a lot to do with the fact Michael Frolik is now playing for the Winnipeg Jets. Quenneville hasn't been able to find a replacement for Frolik on the first PK unit this season. Marcus Kruger has been the mainstay and lately he's been paired with Michal Handzus. Frolik, though, was a big reason why Chicago was the third-best shorthanded team in the League at 87.2 percent last season. The Blackhawks' PK is 28th at 74.6 percent. 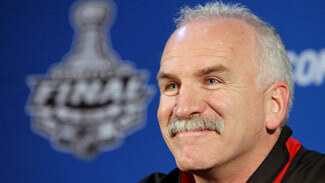 "I'd give Fro some credit, he did a great job," Quenneville said. "The only year he did it we really had a nice year with him, but I think everybody else should be able to help out and let's get it back." * Columbus right wing Nathan Horton is skating with the team and could be cleared for contact soon. Horton had shoulder surgery on July 17 and Kekalainen said the team was told it would be six months before he could play. "He's probably a couple of weeks away still, but he's getting closer now," Kekalainen said. "It all depends on when the medical staff feels his strength is at 100 percent. They won't rush it for one game or two games." Marian Gaborik, who has been out since Nov. 14 with a left knee injury, could return this week. * Trotz said goalie Pekka Rinne (hip infection) has begun exercising, but he's not close to a return. Meanwhile, Carter Hutton was named the NHL's Third Star of the Week for last week after he went 3-0-0 with a 1.33 goals-against average and .960 save percentage. Marek Mazanec was the NHL's Rookie of the Month for November, when he went 5-4-1 with a 2.00 GAA and .932 save percentage. "We're hanging in there," Trotz said.